Has AI lived up to its billing so far? In some cases, there is too much hype, but paradoxically, the potential opportunities and benefits of AI are still, if anything, under-hyped. Often, the impact of new technologies is overestimated in the short term and underestimated in the long term, and while there is a lot of noise regarding AI, there’s been a lack of in-depth discussion and analysis of how it’s actually going to transform businesses. Most organizations aren’t exploiting the potential of AI; they are just at the beginnings of their AI journeys. What should be holding companies back is a lack of talent, but it’s actually a lack of understanding of what’s possible – particularly at the top of larger enterprises. Are there any functions and sectors that are utilizing AI more effectively than others? While everything has the potential to be improved by AI, two notable areas are marketing, which for a long time has been the leading adopter of AI techniques, and the automotive industry, where there is a realization that self-driving vehicles are coming and will change the industry. Other industries are earlier in their AI journeys but are already seeing an impact. For example, EY has helped develop a chatbot for a national blood bank, helping to reach younger donors through a user experience combining AI technologies, social media and human curation. EY has also assisted a global bank to use Natural Language Processing technology to automate voice and text analytics for its complaints and compliance processes. There are some obvious factors. One is talent – AI is still a small field. According to a recent EY pulse survey, 56% of respondents saw a lack of AI talent as their greatest barrier, a sizable jump from the 36% reported just four months earlier when EY posed the same question to a separate group of technology professionals. The industry is doubling in size each year, but it’s still very small given the expectations. In addition, there are few good enterprise AI products – the space is still dominated by people coming from a technology background. We need to see more input and influence from business-driven individuals who care about creating something with value or who have a burning problem they need to solve. Meanwhile, the platform ecosystem is very immature, and existing platforms are principally targeted at data scientists and experimentalists – there’s still little in the way of truly enterprise-grade tools. Finally, the media tends to focus on the fears associated with AI rather than on the benefits – consequently, leaders at large enterprises may spend more bandwidth addressing those fears than exploring the opportunities created. The AI community needs to take ownership of this issue and drive conversations that allow business leaders to address and move past some legitimate concerns. The biggest risk is non-adoption. Every challenge in the world, and in business in particular, is an opportunity for AI. Adopting AI will require patience and a willingness to learn, and will be complex and lengthy, so firms need to start now. Many early projects will have a low return on investment (ROI) and a limited impact – they primarily provide learning opportunities. But that learning is essential and the first step on a transformational journey that will touch every business. Another big risk is talent. The AI community is still very small, as is its most important subfield, machine learning (ML). Good talent is hard to find and hire. This leads to a significant risk of the Dunning-Kruger effect – people believing they know much more than they do – and the risk of over-promising and under-delivering is high. Bias in ML is potentially a problem – if there’s bias in your data, AI will amplify it unless you specifically put in checks to prevent this from happening. AI systems also make decisions faster, so businesses must develop appropriate risk monitoring and management approaches. Both – senior leadership should drive a top-down approach while enabling a bottom-up approach. Technologists’ natural inclination is to learn a new technology then look for ways to apply it. That approach is a great way to develop corporate knowledge and experience, but you shouldn’t expect a big ROI initially because you’re focused on learning rather than on identifying key business problems and developing solutions for them. AI is not perfect. These technologies will make mistakes, although they will diminish over time, but it’s key to recognize what “good enough” looks like. If you’re running a nuclear reactor, then it has to be perfect – if your business makes ice cream, then not quite so. How accurate does a solution need to be to achieve value for the business? Work this out, then think about the technology – not vice versa. How is EY embedding AI in its business? 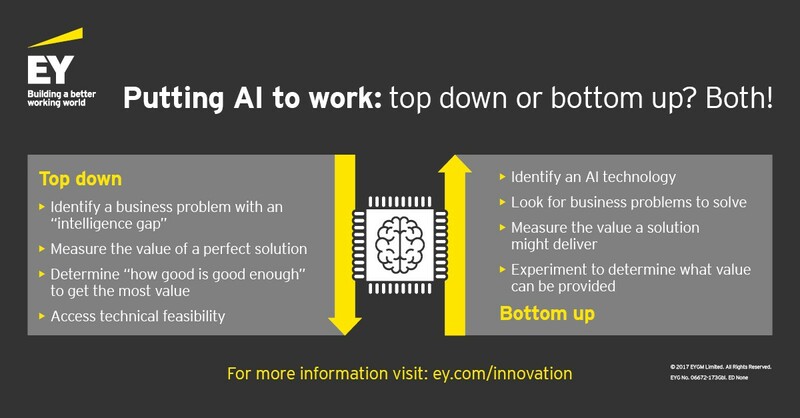 EY is infusing AI into much of what we do in two ways: we are incrementally adding AI to current approaches, and we are also looking at new business models and using AI to develop them. In audit, for example, organizations have become more complex while the need for transparency continues to rise. AI provides an opportunity to transform the audit to increase society’s and investors’ confidence in organizations large and small. EY is also working to transform its tax and assurance services using AI, for example, by developing an intelligent tax classifier that uses ML models to classify taxable transactions. 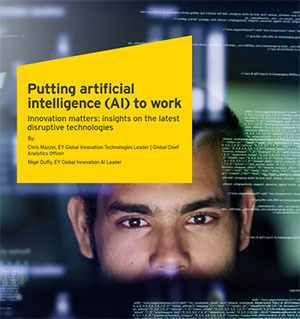 In addition, EY Fraud Investigations & Dispute Services (FIDS) has assisted global pharmaceutical companies with email, instant messaging, voicemail and document reviews to comply with regulator inquiries, using AI and advanced analytics technologies. FIDS also helped a multinational food and beverage company with a fraudulent invoicing case that resulted in 97% accuracy in identifying suspicious invoices through the use of ML technologies. 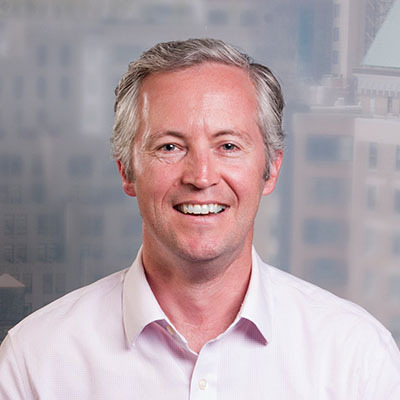 Chris is responsible for exploring a portfolio of emerging technologies, including blockchain, AI and robotic process automation. His focus is on determining how these technologies create opportunities for EY to incorporate into its own business operations, as well as considering the implications for EY’s clients. 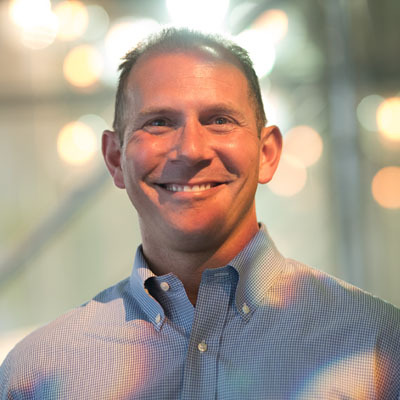 As EY Global Chief Analytics Officer, Chris leads the EY Global Analytics Center of Excellence, which aims to incorporate data and analytics into EY’s offerings across all business lines to help clients grow, optimize and protect value. As part of the EY Global Innovation team, Nigel leads the application of AI throughout EY, helping it to be effectively leveraged across the organization. He is also responsible for expanding and further strengthening EY’s relationships with start-ups and academic and business communities worldwide. * Views expressed are opinions of authors Chris Mazzei and Nigel Duffy.